MIAMI, FLA. (November 7, 2017) - At a time when many people feel shut out of the rewards of a growing economy, the business community must step up to build stronger, more resilient, and inclusive communities. Peter L. Scher, chairman of JPMorgan Chase & Co. Mid-Atlantic region and head of the company’s corporate responsibility initiatives, will explore how this economic imperative can help secure a long-term future for all at the upcoming Florida International University Worlds Ahead lecture, November 14, 2017, 9:30am. 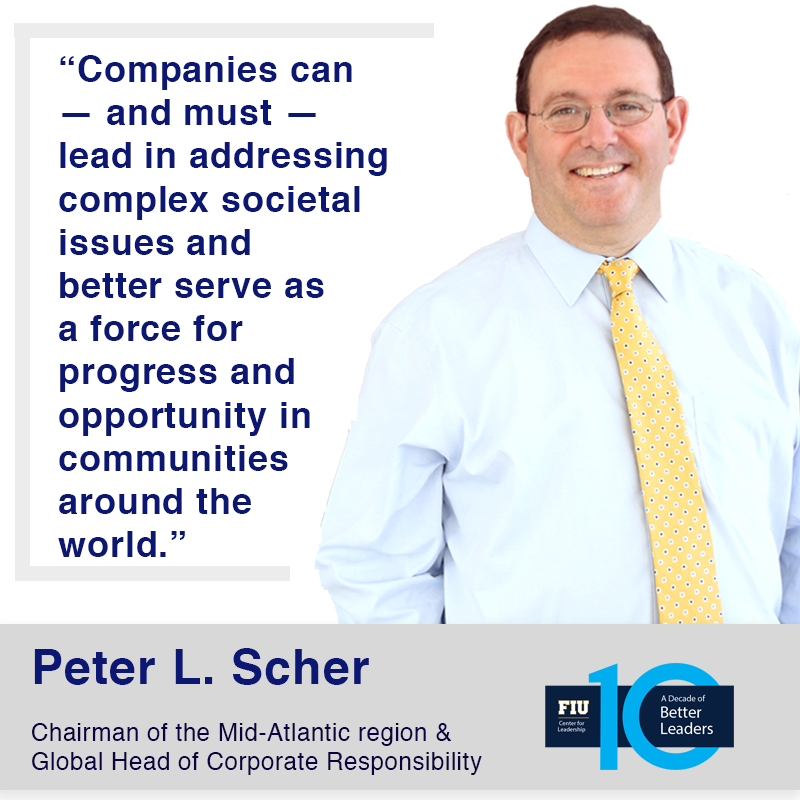 In his lecture, “The Role of Business in Society,” Scher will highlight how and why companies must take leadership roles in addressing complex societal issues and promote progress and opportunity in communities worldwide. Scher led development of JPMorgan’s Global Cities Initiative, New Skills at Wor, Invested in Detroit and the Global Health Investment Fund. His decade in public service included roles as U.S. Special Trade Ambassador, a lead U.S. negotiator on China's entry into the World Trade Organization, Chief of Staff for the U.S. Trade Representative and the U.S. Department of Commerce, and Chief of Staff to former U.S. Senator Max Baucus. Scher currently serves on the Board of Trustees for American University and the Brookings Institution and the Board of Directors of the Economic Club of Washington, D.C. He is a member of the Council on Foreign Relations and the Atlantic Council task force on EuroGrowth. Scher’s Worlds Ahead lecture will be held on at the Graham Center Ballrooms at the Florida International University Modesto Maidique Campus (11200 SW 8th St., Miami, FL 33199). The lecture is free and open to the public, but advanced registration is recommended. Click here to register online lead.fiu.edu/scher.